Rival Burner Reviews & Hot Plate Reviews. Great for dorm rooms, offices, studio apartments, etc. 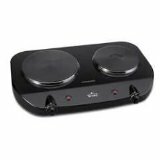 This hot plate sounds great from all the features it has, plus the price is very reasonable. However, it seems that they have a lot of these being returned because they don't work properly directly out of the box. 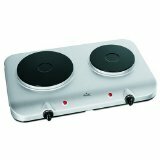 In my opinion you would be better off with something such as the Kalorik DKP-21898 1400-Watt Portable Chrome Cooktop with 2 Cast-Iron Cooking Plates . This portable range is similar in features and price, but much more reliable. This double hot plate has some great features, but unfortunately takes forever to heat up. I would recommend you buy something such as the Maxi-Matic EDB-302 Elite Cuisine 1000-Watts Double Hot Plate . This double cooktop is about twice the price, but still very reasonable. It is much more efficient and a much better unit overall. Unit measures 10.5" by 11 2/7" by 4 2/5"